Item response theory (IRT) has moved beyond the confines of educational measurement into assessment domains such as personality, psychopathology, and patient-reported outcomes. Classic and emerging IRT methods and applications that are revolutionizing psychological measurement, particularly for health assessments used to demonstrate treatment effectiveness, are reviewed in this new volume. World renowned contributors present the latest research and methodologies about these models along with their applications and related challenges. Examples using real data, some from NIH-PROMIS, show how to apply these models in actual research situations. 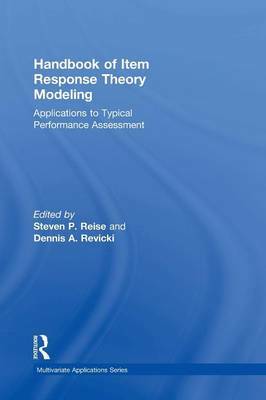 Chapters review fundamental issues of IRT, modern estimation methods, testing assumptions, evaluating fit, item banking, scoring in multidimensional models, and advanced IRT methods. New multidimensional models are provided along with suggestions for deciding among the family of IRT models available. Each chapter provides an introduction, describes state-of-the art research methods, demonstrates an application, and provides a summary. The book addresses the most critical IRT conceptual and statistical issues confronting researchers and advanced students in psychology, education, and medicine today. Although the chapters highlight health outcomes data the issues addressed are relevant to any content domain. Differences between cognitive and non-cognitive constructs and the challenges these bring to modeling. The application of multidimensional IRT models designed to capture typical performance data. How to evaluate measurement invariance, diagnose problems with response categories, and assess growth and change. Part 1 reviews fundamental topics such as assumption testing, parameter estimation, and the assessment of model and person fit. New, emerging, and classic IRT models including modeling multidimensional data and the use of new IRT models in typical performance measurement contexts are examined in Part 2. Part 3 reviews the major applications of IRT models such as scoring, item banking for patient-reported health outcomes, evaluating measurement invariance, linking scales to a common metric, and measuring growth and change. The book concludes with a look at future IRT applications in health outcomes measurement. The book summarizes the latest advances and critiques foundational topics such a multidimensionality, assessment of fit, handling non-normality, as well as applied topics such as differential item functioning and multidimensional linking. Intended for researchers, advanced students, and practitioners in psychology, education, and medicine interested in applying IRT methods, this book also serves as a text in advanced graduate courses on IRT or measurement. Familiarity with factor analysis, latent variables, IRT, and basic measurement theory is assumed.